Ingredients: organic thick rolled oats, organic whole wheat flour, organic honey, organic sunflower oil, organic almonds, organic sesame seeds, organic sunflower seeds and organic raisins. Contains wheat and tree nuts. Ingredients: organic thick rolled oats, organic whole wheat flour, organic honey, organic sunflower oil, organic coconut chips, organic rolled quinoa and organic dried cranberries. Contains wheat. Ingredients: organic thick rolled oats, organic whole wheat flour, organic honey, organic sunflower oil, organic almonds and organic flax seeds. Contains wheat and tree nuts. 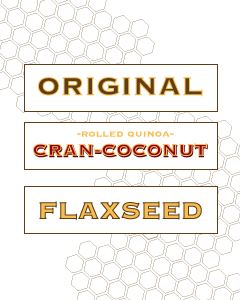 Enjoy all three of our handmade organic granola. In 2012, after 28 years of service, the Café closed its doors. 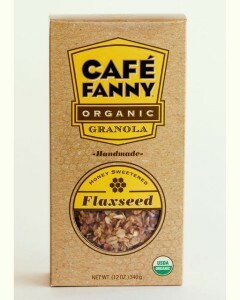 Soon afterwards Café Fanny Granola was sold to Cassandra Chen. 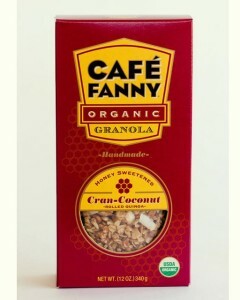 Her artisanal caramel company, CC Made, needed room for growth and when the opportunity to produce Café Fanny Granola presented itself she knew it was a dream come true.